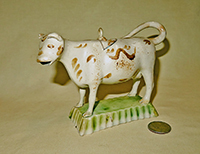 I am using this term in a very general and admittedly inappropriate way (although I’m not alone in doing so) to refer to my small collection of British earthenware (and a few porcelain) cow creamers dating from the 18th and 19th centuries (with a few early 20c). Very recent ones with similar shapes and styles are for the most part covered either under the manufacturer (e.g., Kent, which has adopted some of the older molds from creamers shown here), or under ‘Places’, or just lumped in with all the other modern creamers. 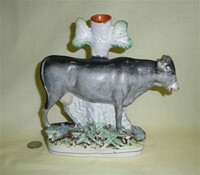 The main English centre for producing pottery cow creamers, starting around 1740 with saltglazed stoneware, was Stoke-on-Trent and vicinity (which is in Staffordshire, thus the general term; Stoke-on-Trent is made up of six distinct towns: Tunstall, Burslem, Hanley, Stoke, Fenton and Longton - collectively known as "THE POTTERIES". 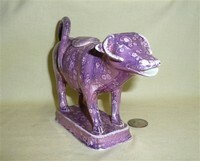 See their web site, www.thepotteries.org, for lots of good basic information on the area, the potteries, potters, etc.). However when they became popular, inspired at least a bit by Schuppe’s silver ones, other pottery centers – notably in Tyneside, Yorkshire, South Wales and South Scotland -- also began producing them, in part because Staffordshire potters moved to these areas to establish or run factories. 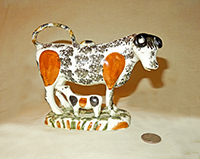 I have trouble distinguishing creamers from these other centers from those of Staffordshire, unless the seller provides information – with the exception of the Swansea, South Wales creamers, many of which are quite distinctive. I have therefore included a description of these Welsh potteries and their cow creamers down near the end of this page. I have also added a section dealing with Spill Vases, many of which used the creamers as part of their decoration. My collection pales in comparison to the fabulous Keiller Collection in the Stoke-on-Trent Museum & Art Gallery, but I do have a number that I’m quite fond of. One problem with these creamers – as indeed with any ‘figures’ of the period, be they of prople or animals - is that not many of them have a well established provenance; such is the case even with the Keiller collection – I believe that only three of the 667 in that collection have the maker’s name impressed. 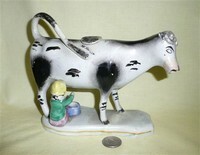 As opposed to silver creamers, where hallmarks and assays are the norm (and generally required by law as well as by the guilds), most of the early pottery creamers don’t have marks or any sort, and since they were basically common household items, the maker was of little importance to the buyer. I will give as much information as I have, but in general I have found that the sellers – even ‘Staffordshire’ experts – don’t have precise information. I would welcome any and all help in improving my attributions. One other note is that most of these creamers have restorations of some sort, although in most cases they have been carefully done by professionals and are hard to discern. 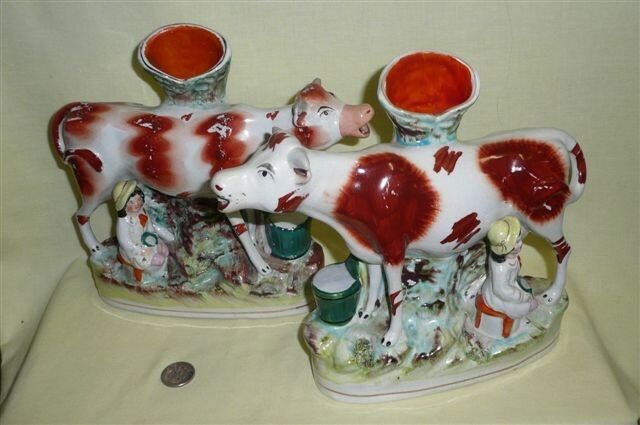 The need for restoration isn’t surprising, since the horns, tails and ears are quite fragile (except for when they were cleverly smushed down onto the cow’s head or body), and these were made for daily use more than for display. Cow creamers were, of course, only a very small component of the wares produced in Staffordshire, which had been noted for its potteries for hundreds of years. Most pieces, naturally, were simply utilitarian – bowls, pots, plates, etc. Starting in the 1700s, in keeping with the overall trends of industrialization in Britain, the potteries became more mechanized and organized, and so they remain today although there have been an almost infinite number of changes in process as well as ownership and organization of the firms. There are a number of good sources for the potteries history, but for a short version I’d suggest http://www.historynet.com/potteries-of-staffordshire.htm . At around the middle of the 18th century, in response to a growing demand for both quality and decoration, the potters began to complement their functional items with figures of people and animals. 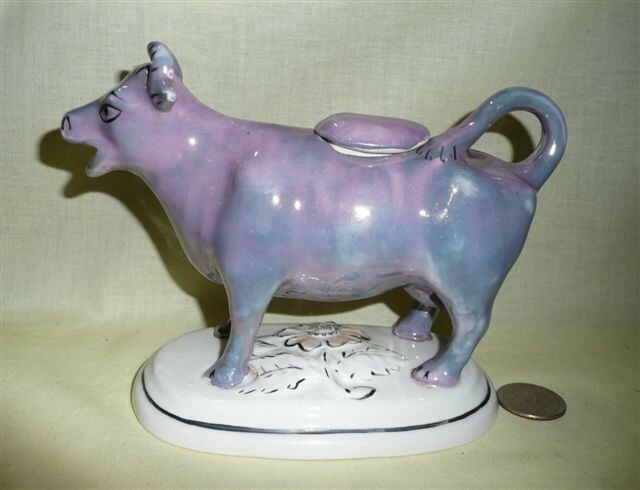 Not unnaturally some of these more fanciful items also were designed to serve useful purposes such as holding spills, and – after they became popular – serving milk and cream. 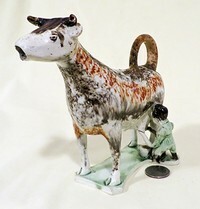 For a brief introduction to the art of the very popular (and still very highly sought by collectors) Staffordshire figure, try http://www.adelekenny.com/-staffordshire-figures.html. For those who want a more in-depth treatment, I can heartily recommend Pat Halfpenny’s excellent book, "English Earthenware Figures, 1740-1840", published by the Antique Collector’s Club and available through a number of used book sellers both in the UK and the US. One more note – I use blue-tack (poster putty) to hold the lids on. I first encountered it in London in 1995, where it was used to hold up the pictures of call-girls in the phone booths. It seems to hold quite well for several years without hardening or leaving a mark, which is presumably what endeared it to the pimps and made the practice tolerable to the police and phone company (albeit in more recent trips the practice seems, sadly, to have faded). It shows in many of the pictures. If anyone has any better suggestions, I’d appreciate it. 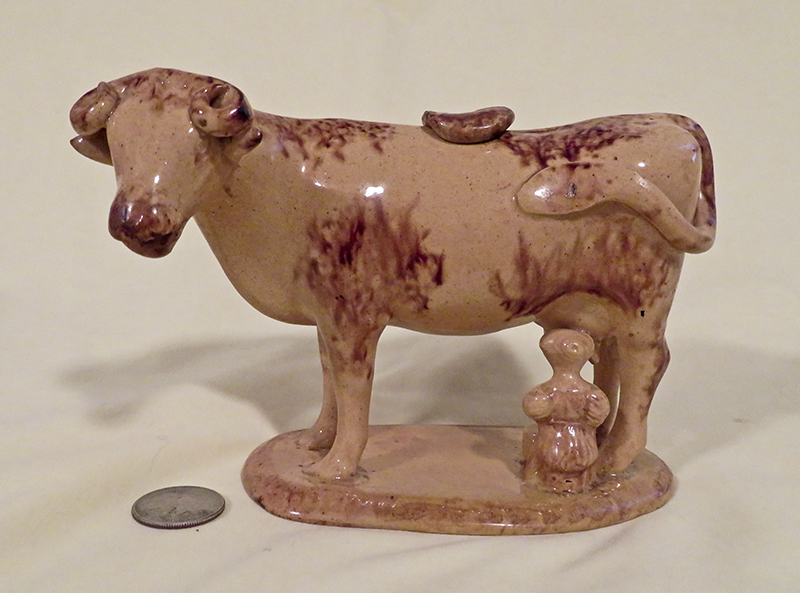 This is my favorite – a very lovely model of a cow and calf with boscage or bocage…a term for leafy decoration on pottery of this era; I have seen this style referred to as “Walton School”,after John Walton. I bought this creamer from the London store of Oliver-Sutton antiques in Kensington, who attributed it to Tittensor, circa 1780. Tittensor is both a family name, and the name of a village in Stafford, between Newcastle-under-Lyme and Stone. Although information is sparse, it’s most likely that this creamer can be attributed to Charles Tittensor, who was a small scale potter who specialized in bocage and other earthenware figures, working in Shelton in the early 19c, and who had a number of different partners over the years. The date I was given by Oliver-Sutton is almost certainly incorrect both because (as noted by Pat Halfpenny) Charles Tittensor was not recorded as a potter until after the turn of the century, and because bocage was not introduced until around 1810-1815. Given the uncertainties, I’d simply say that this lovely underglaze painted piece is from the first quarter of the 19c. Here is another favorite, a purple splash luster creamer in perfect condition that I acquired in early 2013 from John Howard of Woodstock, an Antique English Pottery Specialist, just as he was shipping it to New York for a ceramics show. Unlike the Tittensor one above, however, the maker is unknown – John could only tell me that he acquired it in Burton on Trent, and that it was manufactured in Staffordshire around 1820. He did note however that this is a very rare example, and in his four decades in the business it is one of the few that he has seen with no restorations or damage. 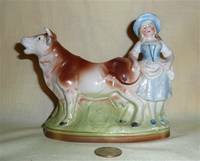 At the time it was made, luster ware was at or near the top of the market for earthenware figures, so I can only imagine that the original owner either bought it more for decoration than utility (like the Tittensor piece that would be too unwieldy for daily use), or at least used it on only special occasions. Certainly most of my others have not fared nearly so well as this beautiful cow. 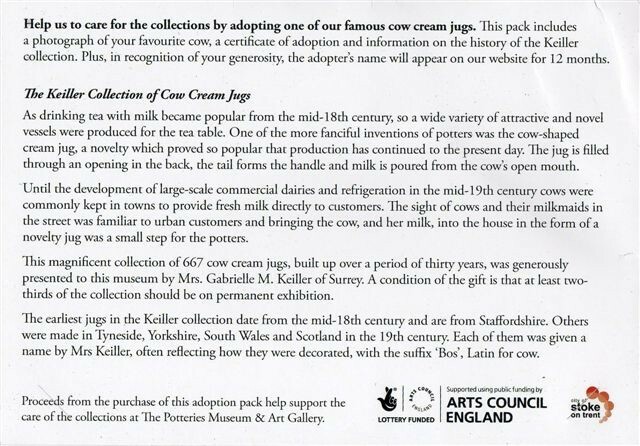 When I went to The Potteries web site for some information a while ago, I found that for the sum of £10 one can “adopt”, at least for a year, one of the famous Keiller collection cows. So…I couldn’t resist adopting their pink luster one, which it turns out Mrs. Keiller had named “Sentorial Bos”. Cute but no, I have not been tempted to name mine. 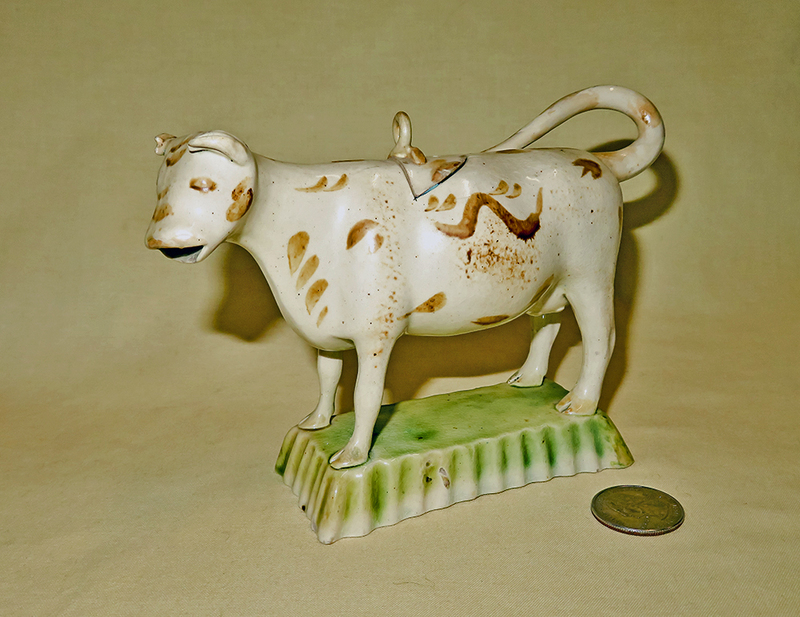 I purchased this early green and white cow creamerfrom Oliver-Sutton in LKondon at the same time as I acquired the Tittensor. It was identified by them as a Whieldon, circa 1780, and bears an old inventory #509 from the C.B.Kidd collection. Thomas Whieldon (1719-95) of Fenton Low, Stoke-on-Trent, was a Master Potter who – according to the Famous Potters page from that town (www.thepotteries.org/potters) taught both Josiah Spode and Ralph Wood, and from 1754-1759 was in partnership with Josiah Wedgewood. There is more information about him a couple sections down. 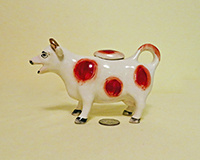 This creamer has a ‘mushroom’ handle on its lid, which like some other very early ones, has simply been cut out of the back of the cow rather than being a separately fashioned plug.ood. I have spent some time on the web trying to find out more about the C.B.Kidd collection, since not only do I have some pieces from it, but they seem to have been offered (at high prices) by quite a number of knowledgeable antique dealers over the years. Courtesy of Robert Walker of Polka Dot Antiques I have learned that Captain Charles Bernard Kidd was born in 1880 in Dartford, Kent, and educated ‘privately’ and at Cambridge. He was a keen hunter of hounds and was Master of Foxhounds of the Southdown Hunt from 1910-1913, which post he relinquished when he accepted a commission at the beginning of WWI. He was a well known collector in the early 20c, and his collection was likely sold by Sotheby’s in the 1950s. 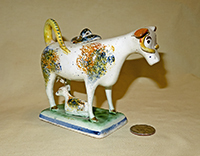 This finely potted creamer with milkmaid was ascribed by the knowledgeable seller, Andrew Crowley of Liverpool, to Thomas Whieldon, circa 1760, and acquired by him from the “wife of a construction baron (recently deceased) from her Georgian townhouse in the Chelsea area of central London. The pottery pieces were mostly Whieldon and yorkshire Creamwares, with the collection there was an inventory book, which indicated that this creamer was purchased in 1972 from an antique shop on the nearby Kensington church street.”…which just happens to be the location of Oliver-Sutton’s shop. His description notes “the cream coloured earthenware body covered in coloured glazes derived from manganese, copper, cobalt, iron and antimony. The colours were sponged onto the body and then covered with a clear lead glaze, the subsequent firing caused an intermingling of the colours, this type of ware is also called Tortoiseshell ware.” This jibes well with what I have recently read about Whieldon in Pat Halfpenny’s excellent book, "English Earthenware Figures, 1740-1840". 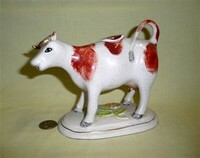 This early creamer does have a bit of damage – a chip to its lid and one to the left ear showing the creamware of the figure, and some nicely done restoration to horn tips and the milkmaid’s right arm. Overall it’s a lovely early example. Here is a third that was attributed to Thomas Whieldon (by a faded sticked under the base), in this case 1770-1780. 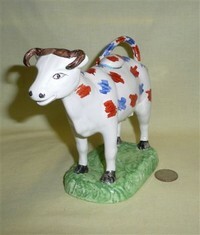 The base cow is indeed quite white, and the colors are typical of the era. I really have no way of verifying that any of these three are actually from Whieldon – but if so, he was a master of many styles. 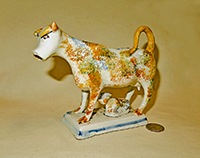 It’s appropriate here to say a bit more about Thomas Whieldon, who is probably the most well-known Staffordshire potter of the mid 18c, and about the early evolution of Staffordshire figures such as my cows. Most of this has been extracted from Pat Halfpenny’s book referenced above, and an article on Pearlware by Terrence Lockett found on the potteries web site. Whieldon was baptized in Stoke-upon-Trent in 1719, and was an established potter at least by the mid 1740s – in works that he first rented and then purchased in Little Fenton. By 1750 he also had acquired pot works in Fenton Low – some half mile away – which he rented to others. Whieldon remained in business until around 1780, at which time he razed his factory and converted the land into ‘pleasure grounds’ around the home of himself and his (by then) third wife. Whieldon, like most of the other 150 or so Staffordshire potters of the period, produced tableware as well as the figures. 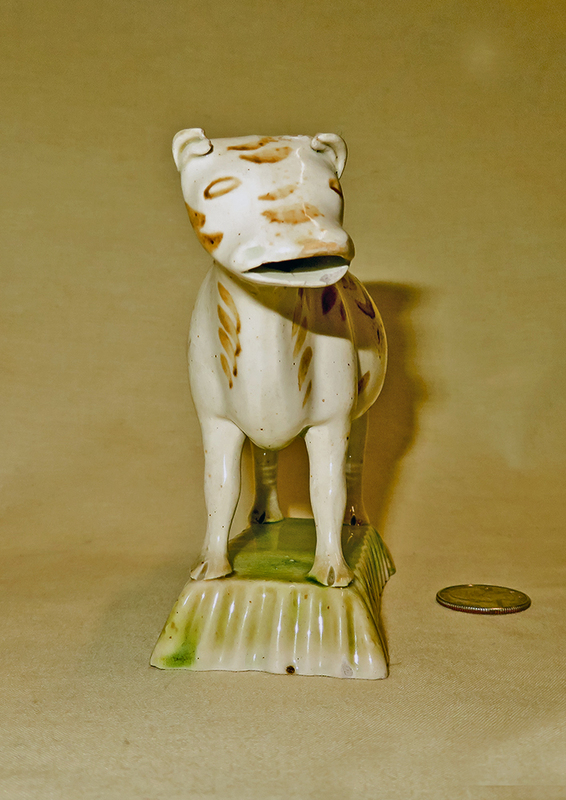 He made saltglazed stonewares as well as the tortoiseshell and enameled creamware. The term creamware, for which he seems to be best known, denotes cream colored eartenware. 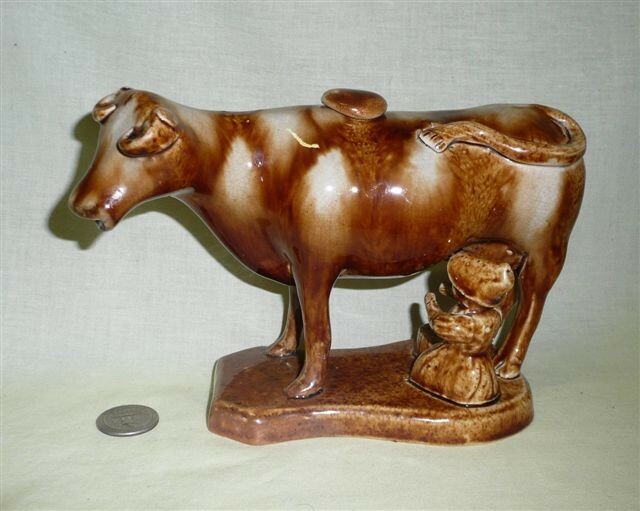 The figures like my cows were fashioned with a combination of hand and press moulding, dried and then assembled using slip, then biscuit fired. 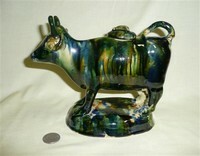 The piece was colored with metal oxides – manganese brown, copper green, iron yellow or cobalt blue – then covered with a liquid lead glazing and ‘glost’ fired. This process allowed only a limited range of colors due to the high temperature required to fire the glaze. Equally important for the increasingly sophisticated buyers of the latter part of the 18c, it produced a product that was not as ‘white’ as fashionable Oriental porcelains. To respond to this market, Staffordshire potters in the 1770s developed what they referred to as ‘China Glaze’ – basically simply substituting cobalt oxide for iron oxide in the glaze, which produces a whiter ware with a light bluish tint. Josiah Wedgewood independently came up with a similar process – adding whiter clay and employing cobalt in the glaze to give it a bluish cast. Wedgewood termed his ware ‘Pearl White’, and today the term for the two similar products is‘pearlware’. Whieldon, incidentally, was out of the game by this time. 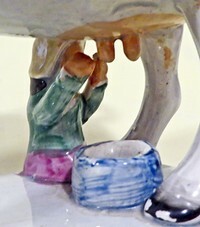 Although the typical approach for English-made ‘white’ tableware with an oriental touch was to paint underglaze in blue and then apply the china white or pearl white glaze, early ‘pearlware’ figures took advantage of the new approach by tinting the glaze with other metal oxides – copper for green, iron for yellow, manganese for brown or purple, and more cobalt for darkler blue - and then individualy handpainting them on the figure. Pat Halfpenny distinguishes these figures of the last quarter of the 18c as ‘coloured glazed’. The next evolution involved painting or sponging with the same metal-oxide based colors on the biscuit-fired white clay figure, then dipping it in liquid pearlware glaze and firing to seal the colors, more or less as was done with creamware. 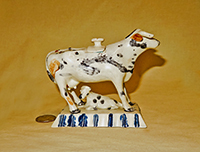 Relief-moulded pieces including figures (and cows) that used this technique from around 1780-1840 are referred to by Pat Halfpenny as underglaze painted, although they are also known as Prattware. 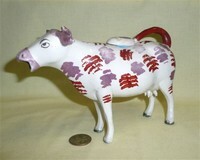 Other under-glaze techniques include ‘spatterware’ and ‘spongeware’, as well as transfer printed wares to include the ‘Willlow’-type patterns in imitation of fashionable Chinese ware (after ~1820 clear glazes began to replace the pearlware glazes on these). A yet further late 18c embellishment involved on-glaze decorating a pearlware glazed piece. Tese were termed ‘enameled’ by the potters. This process allowed for a greater range of colors, but was more expensive because it required at least three firings – biscuit, glaze or glost, and then one or more to ‘burn’ the colors (and maybe even more for effects such as lustre or gilding, and even over-glaze printing, used especially for commemorative jugs and mugs). 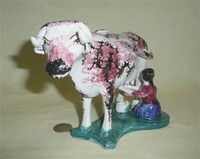 A good many of my colorful early 19c and later creamers are of this ‘enameled’ or enamel painted type. This cute small cow creamer with recumbent calf bears the mark “Leeds” in script. 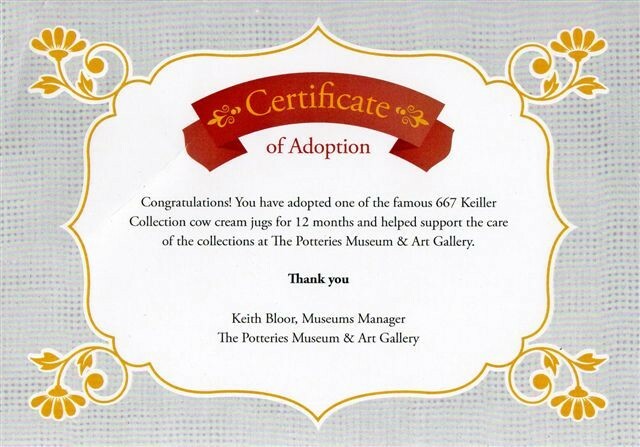 It dates from @1800, and was #883 in the same Kidd collection. 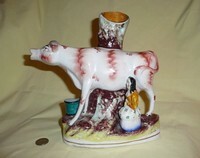 From www.worldwideshoppingmall.co.uk’s section on pottery we learn that “Brothers' John and Joshua Green in partnership founded LEEDS POTTERY in Leeds in 1770 with Richard Humble.” More information about Leeds is to be found way down near the end of the Staffordshire area (a few up from the Welsh Ceramics and Swansea Potteries area) in a section with a white cow and calf. This selection of three creamers is a good place to say a bit more about styles of early English creamers (and other figures). All three here are multi-colored underglazed pottery – the one in the middle, like the one with green coloring above, has an incised lid, and came from the Kidd collection via Oliver-Sutton shop which called it ‘Whieldon-type’. From its coloration it could be termed Creamware. I believe it’s quite early, say mid 1780s, from before folks started making round holes in the top and fashioning separate plugs. The two surrounding it are whiter in color, thus pearlware (see feature articles at www.thepotteries.org for some good information if you can’t find a copy of Pat Halfpenny’s book); presumably the clay in the body is whiter (no breaks on these so can’t be sure), and the glaze is tinted with cobalt=oxide. They are also 18c, sold to me (at London antique fairs) as being from around 1790. All three could be termed ‘Pratt Ware’ or ‘Prattware’, which as noted above became the generic term for underglaze colored cream and pearlware that was made rather widely in the UK from about 1785 to 1840. 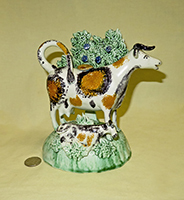 The best information source on these that I have found is “Pratt Ware – English and Scottish relief decorated and underglazed colored earthenware 1780-1840” by John and Griselda Lewis. From there we learn that there was a Pratt family of potters “who were working at Lane Delph in the late eighteenth century and also at Felton after 1807”. The term Pratt Ware however wasn’t used until the early 20c, and when a couple of rival authors coined it, based on a very few multicolored underglazed jugs with relief decorations that bore the Pratt name and were in the prototypical style. So the Pratts have been memorialized rather by happenstance, with their name applied to wares made by hundreds of potteries over a span of decades. The Lewis’s book has hundreds of pictures as well as fascinating articles about the Pratts, how the wares were made and colored, and the many locations where this style of decoration was employed until it was surpassed by overglaze enamel colored wares and other techniques that became popular in the early to mid 19c. Here are frontal shots of the cows in the picture above, to show the shape of horns and mouth. 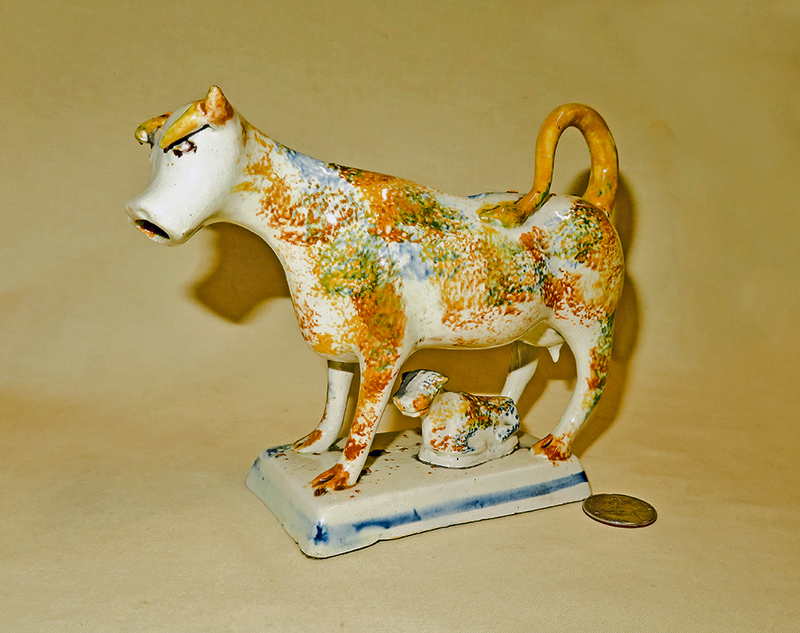 This spatter-painted brown Prattware creamer is very similar to the blue one on the right above. 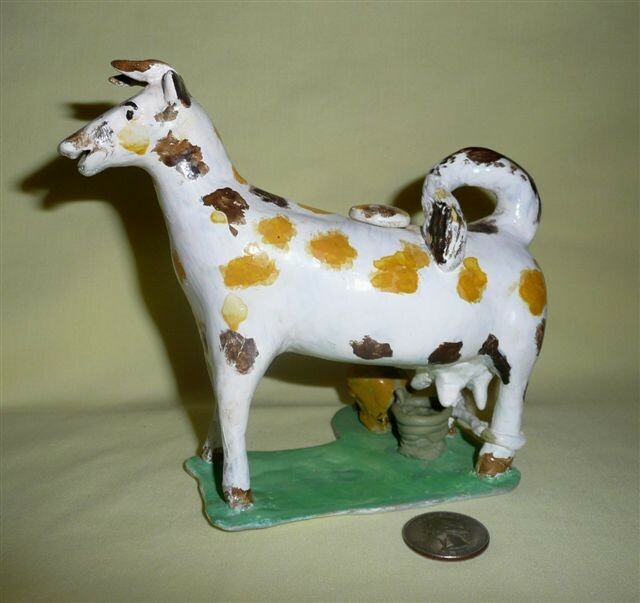 The eBay seller called it softpaste Pearlware, early 19c, and said it came from an Indiana estate where the owner had been collecting from the 50s through the 80s. Bet he paid less than I did, albeit the eBay price was a bargain compared to what these go for in London shops these days. Here is yet another example, this one missing its lid but otherwise in fine condition. In general, I’ve found that many of the earlier creamers have flat-plate bases like these two. The raised oval and rectangular ones seem to come later. Both of these are (presumably) Prattware, dating from the 1790s. The milkmaid and milkman are working hard although she seems to have taken her eyes off the job at hand. The one on the left here is the same as the one with the milkman above…repeated with a couple from the same mold to show that these were indeed sort of ‘mass produced’ in a sense even if handpainted and thus each slightly different. Three more creamers with flat bases – the sellers said from @1820 for the two on the sides, and 1800 for the one in the middle. The one on the left, “Ol’ Ug” I’ve dubbed her, is particularly crude compared to many of the others. 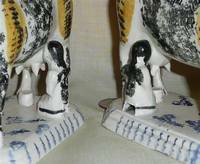 The one on the right is Prattware, and has quite an unusual shape to the face. These three all came from the same New Jersey collection – bought by the seller’s mother in the 1950s and 60s – and all date from the early 1800s. They all have flaws – all are missing a horn, two have no lid, and the one with three large sponge marks also has a repaired tail. Nonetheless they are good examples of early kitchen ware, and hopefully have seen their days of use. This beautiful cow with calf on a flat green base with canted corners dates from ~1810, and is most likely Scottish (the seller stated that the red sponged pearlware is typical of Scotland) of from the north country. It has had some well done professional restoration to the horns and is missing its little lid, but I find it lovely nonetheless. This ‘Prattware’ creamer – with a restored tail and lid and broken horns, probably made around 1790 – was said by the seller (who has kept a very similar one) to have been bought by the wife of a Hollywood magnate from Gloria Antika of Brompton Road in the 1940s, presumably shortly after the end of WWII. 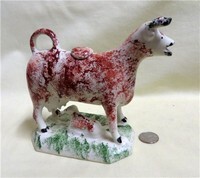 Here is a third older – early 19c – creamer with red, with an admixture of black in the sponged coloring. 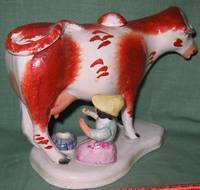 For a rather well molded creamer the painting is quite sloppy – the green of the base carries onto both the hooves and the milk pail and, although you can’t see it, there’s extra paint on the milkmaid’s arm. Its horns are restored, and the right one has been re-attached. The seller indicated that he thought it was likely Yorkshire. 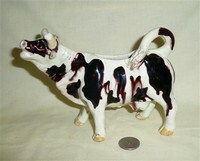 This early creamer with milkmaid has similar red and black coloration on the pearlware body, and also was said to be likely from Yorkshire. 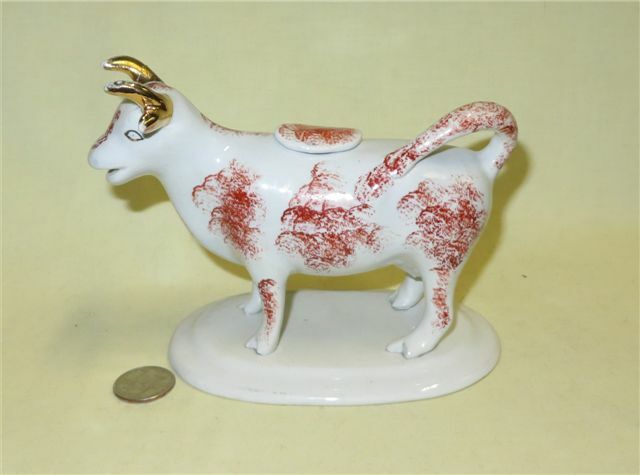 It has a strangely colored stopper that is old if not for sure original, and is missing the very tips of the curled up horns as well as part of its right ear. Still looks pretty good for its age. 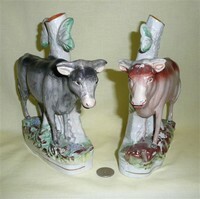 More Prattware, here a pair with the milkmaids – arms at their sides and without any facial characteristics – on opposite sides. Here the curled horns and small ears have avoided damage, and I’d guess that a fine ornamental pair like this didn’t see much hard or regular use. Here are three more interpretations of cows being milked. The sellers indicated that the one on the left was probably from Yorkshire, 1780-1800. The middle one is from around the same date, but looks to be Prattware; and the one on the right was described as Pearlware from @1830 (pearlware seems to be a somewhat ambiguous and general term relating to coloring and glaze, see the reference above). 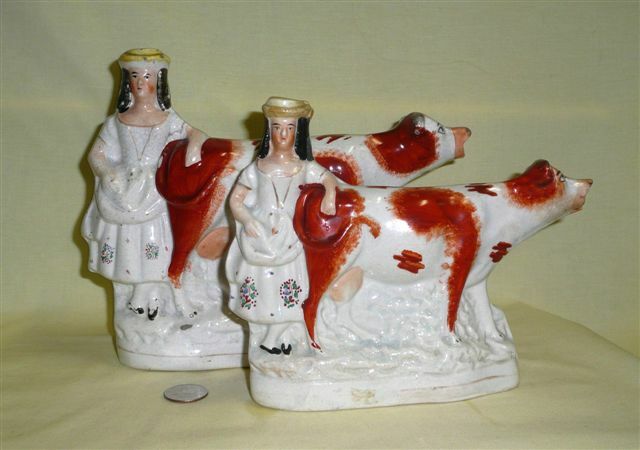 These three have interesting different representations of milkmaids; some potters seem not to bother with arms, others like to include facial features. This is a Victorian era creamer, similar to the pair just below, showing a bit of detail of the hard-working milkmaid and her target. Here’s another pair, Victorian creamers with milkmaids (arms, no hands!) from @1850. They’re quite large and heavy, and have the protective smushing of protuberances (surely there must be a technical term for this…). Two more mid 19c. The yellowish one is in great shape but may well be a reproduction. Her milkmaid has no arms. 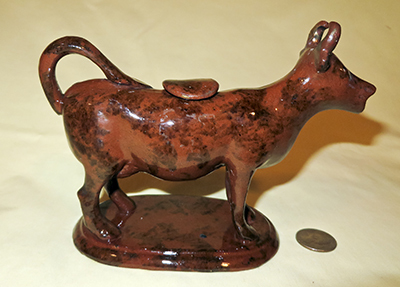 The one with sponge ware brown spots is missing the lid and has restored short horns, but I liked the winsome eyes and it was quite inexpensive. Here’s another nice Rockingham glazed version from ~1840, with a bit of a different shape but still the curled horns against the head. This one is somewhat less lovely, but another good example of mid-19c Staffordshire, presumably in this case a rather inexpensive one at the time. It has some black ‘cold paint’ – i.e. not glazed – that may have been a touch-up after manufacture. It also has a older restored tail and an old replacement lid, not unusual for one of this period. 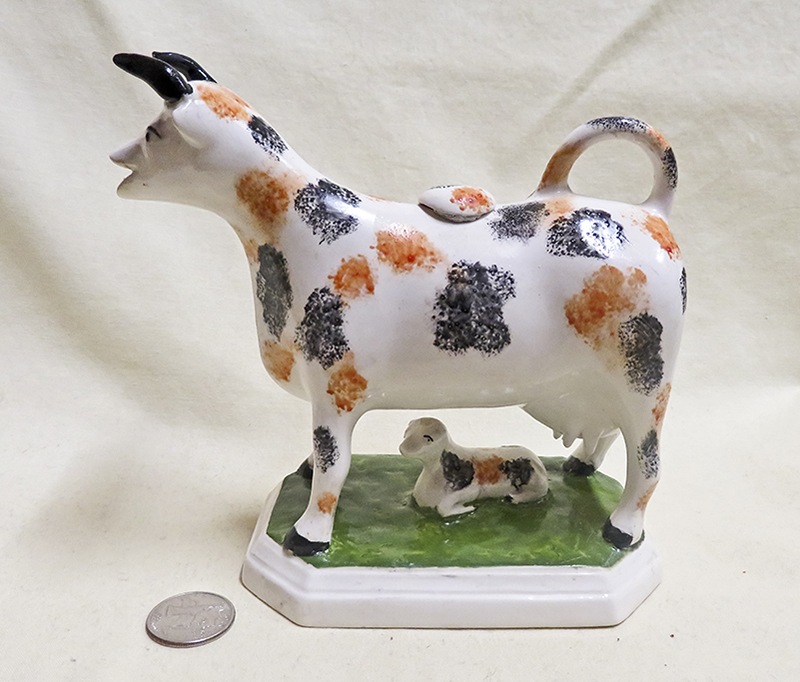 This cow with calf is a fairly recent addition to my collection, and is said to be “probably from a Prattware factory in NE England, @1830”. Here the tail, lower lip and lid have been restored; the ‘smushed’ horns and ears survived intact. Here are three versions of old English ceramic that are really quite different in style and make-up from those above, and must have been designed to be more utilitarian than beautiful. They were probably also quite inexpensive when first sold (unfortunately not now). The two that are similar both have some damage to the horns – I have yet to find one that hasn’t suffered in some way or another. I have no further information about them except that the one with the white base and bark brown spots was said by the seller to date from the 1830s. I would guess that they’re all pre-(or very early) Victorian, since items from that era tended to be significantly fancier. This is a fine example of a treacle or Rockingham glazed creamer, as is described in some detail in the Bennington section. The mold is typical of that used for many of the Jackfield creamers. Other than this one and a similar one with gold on the horns that is in the Jackfield section, I haven't found any of this form that aren't black. gilding, and a somewhat similar but much trimmer shape. This one is similar but without the gold. I acquired this pair in an antique shop on the old walls of Chester. They again seem to be made of reddish earthenware, with a caramel glaze that reminds me a bit of American Rockingham (see the Bennington category). These have large teats and, what I find most unusual, small rectangular mouths. The seller indicated that they were mid-1800s but per usual had no further information. As always, I’d welcome help. This one came from a collection of a lady in New Jersey – essentially identical to the pair from Chester, albeit I didn’t recognize it as such from the picture on eBay. Here’s a caramel colored one quite similar in shape and style. It’s had a fair amount of restoration, horns, ears, and lid. This white one – most likely from the late 19c Victorian period – is in good shape and shows signs of some considerable use since much of the gilt has rubbed off. 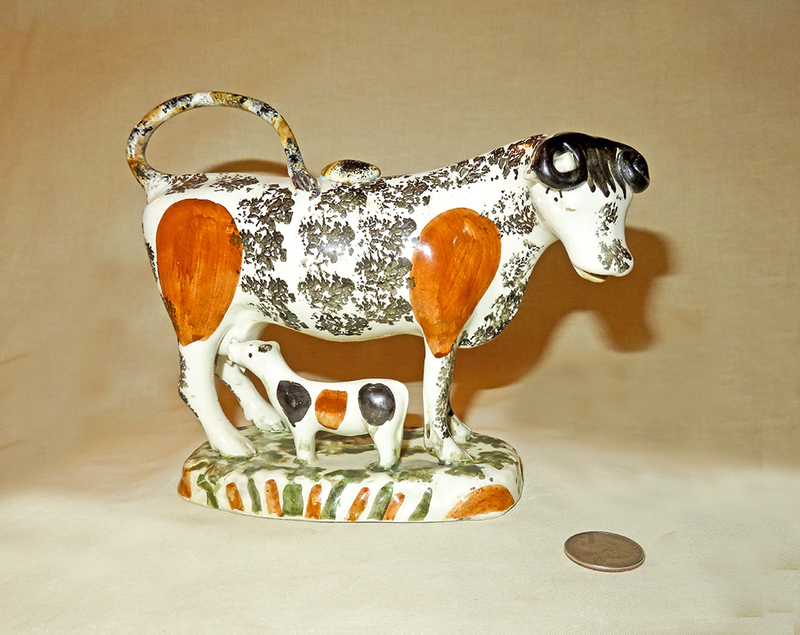 It was surprisingly inexpensive for a creamer of its vintage…probably as much of a surprise to the seller as to me. This one is definitely not “Staffordshire” in the sense of being from one of the early potteries, but is indeed English, sold by a knowledgeable dealer as ‘Late Victorian’, circa 1900. It’s interesting to me on two counts: first the curly hair, and second the fact that it is stamped with a registration number, “Rd No 445,059”. I would like to learn more about the use of these numbers, since this is the only one in my collection so marked. 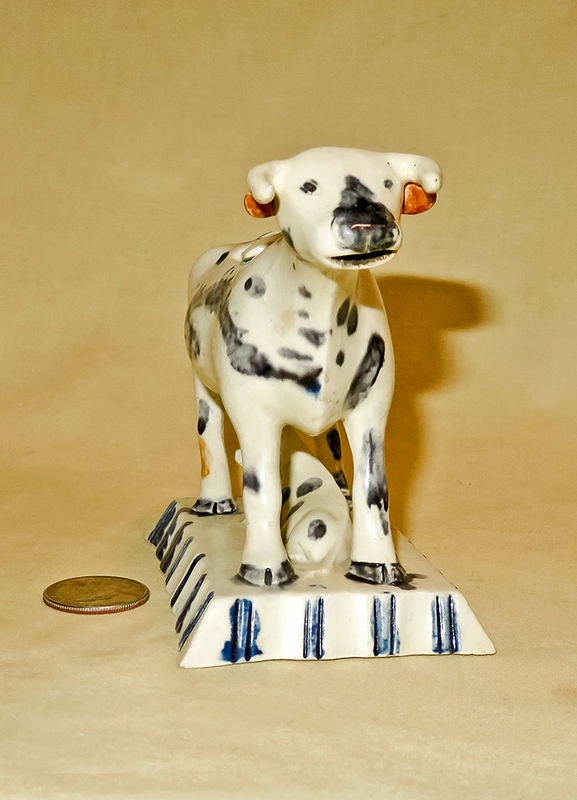 This one has more than minor damage, and could use the assistance of a professional restorer – it’s missing its right ear and has 3 legs and one teat re-glued (ouch). 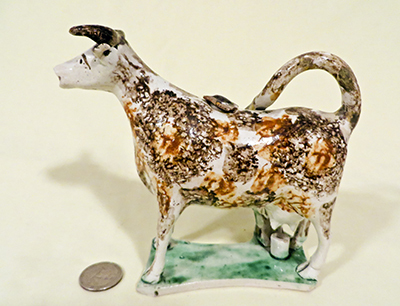 It was unusual enough (and inexpensive as these things go these days) for an early 19c creamer to attract me however – finely molded, painted and glazed, and with no base. I looked the hoof bottoms over carefully, and the best I could tell, it’s never been mounted – which would seem to explain the damage to the fairly delicate legs. This is a very strange variant – included here because it did indeed come to me from the UK, and was dated by the seller to early 19c. 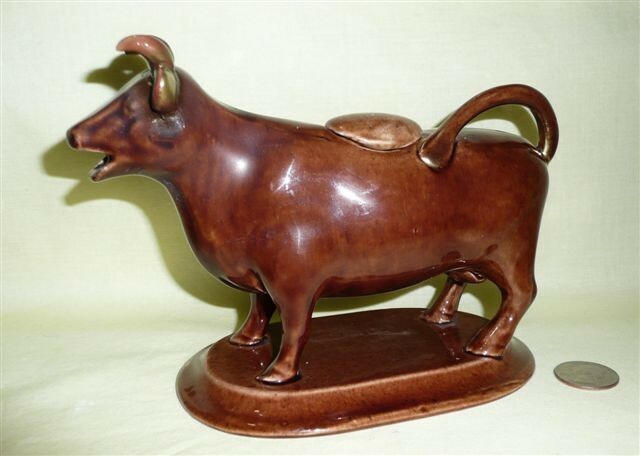 It’s fashioned of heavy reddish earthenware and has a green tinted glaze, most noticeable on the udder. It’s fairly crudely made and has a number of firing cracks. The horns have been replaced, and one of them was then broken at the tip. Nonetheless a very interesting example, and certainly quite early. 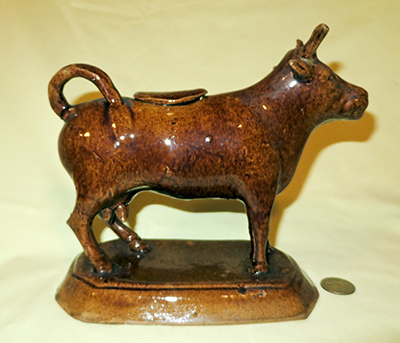 I’m not quite sure what to make of this one – it has the horns curled against the head which would suggest to me a late 19c date, but at the same time has the lid incised into the back, which is more typical of earlier creamers. 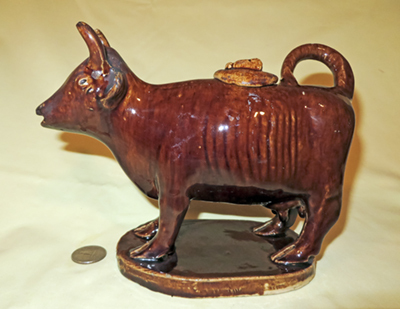 It has crazing, which is not normal for early English earthenware. The seller, who bought it in the 1980s at a Harrogate antique fair, said she thought it had a base at one time but I see no indication of that. It’s possible that it is a 20c ‘reproduction’, but at least it was reasonably inexpensive, displays very nicely, and is different from my other creamers of this general type. Here’s another unusual and – to me – somewhat mysterious example. It has a most interesting face featuring wide eyes and a little curl hanging down its forehead, as well as very unusual large horns. 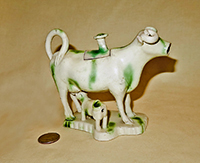 It also has an unusual filled backing somewhat reminiscent of spill vases, albeit this one is clearly intended to be a creamer even if designed to sit on a mantle or against a well. It has a replacement stopper and a couple tiny dings, and the seller indicated that there was likely some restoration to the horns, albeit if so it is very well done. The seller said 19c, which seems not unreasonable. Here’s another very sprightly and somewhat unusual example – said by the knowledgeable UK antique dealer seller to be circa 1850. Except for a re-glued horn which is almost undetectable it’s in fine shape. These two are quite simple, probably initially very cheap, versions that I’d guess were late Victorian era. 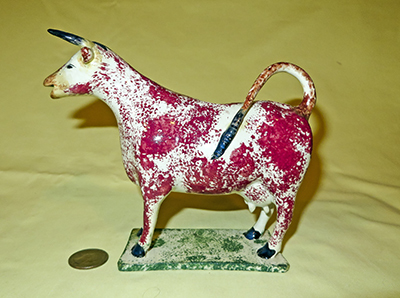 This little red and black splatter-painted cow has had a bit of a hard life – horns glued back on, a number of scrapes through the glaze and paint – but is nice and colorful and still displays well. 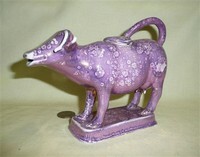 Here are several examples of a creamer style that remains quite popular and is still in production, indeed is the type of creamer available in the gift shop of the Stoke-on-Trent Museum. In the picture of the four without bases, the two with the purple luster bear a orange stamp that I believe says Wade, England (blurry, and the rest is obscured). 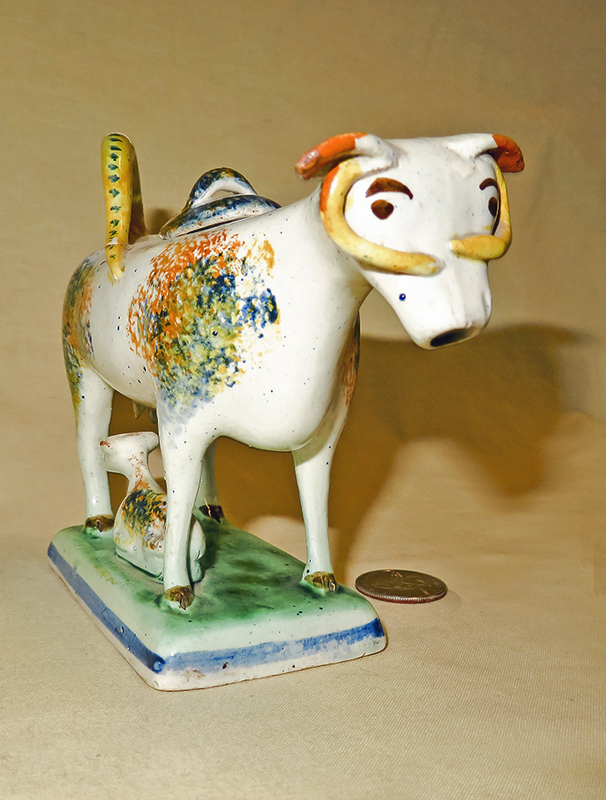 Wade was established in 1810 in Burslem, the town that’s the headquarters of the pottery industry in Stoke-on-Trent, and is best known these days for a small solid ceramic animal collectors set called ‘Whimsies’ that came out in 1953. Their website (www.wade.co.uk) didn’t return anything for a search on cow creamer, so I don’t know if these are really from them, but again this is a very popular mold, and has been made by a number of potteries in the area. See, e.g., Kent under the ‘Factories’ category. The creamer with the reddish markings between the two purple ones has “England” in script on its belly; and for comparison I’ve included a modern one manufactured by the Kent factory between 1944 and 1962; it bears the William Kent logo of a knot with W and K in the loops, “Staffordshire Ware” above and “England” below, and the initials of the artist who decorated it. 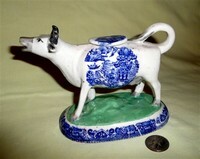 The other two pictures show more examples, including one with a blue-willow transfer, a rather crude one in the middle of the second picture, and another Kent model, the cow with bouquets of blue flowers on flanks and forehead and the raised flower on the base, which is also typical of a large number of creamers. These shots depict in a bit more detail the small variations of one popular version of these type creamers – small leaves and flowers, gilded horns, and an oval base with a raised flower. The one on the right in these photos bears the William Kent logo, the one on the left is unmarked. I’m beginning to believe that the Kent marked creamers are still in production, since they appear frequently and at a very reasonable price in eBay. There are also reputedly older ones on sale also – at a much higher price – and it beats me how one can tell the difference from what’s shown on the web. Here are 3 more examples of the “Kent” style creamer, showing the similarities between a modern one (on the left with blue flowers) and two 19c examples. The older ones, typical of the time, have no identifying marks. So how can one tell what’s new and what’s old? Well, lacking chemical testing of the glaze part of it has to be based on faith (and the eBay feedback system seems to work quite well for instilling trust in the advertisements from the sellers), but the new ones of this pattern are all clearly stamped. Here’s a free-standing ‘Kent-style’ version, black and white spongeware with a bit of brown, that I believe is reasonably early. This one – again with the same style cow – is interesting because it has the horns, ears, and 3-slash gold gilding that’s typical of Jackfield creamers. This creamer bears a resemblance to the Kent style, but is from a completely different mold. The Sandland family website www.sandland.freeuk.com) indicates that there were (at least) two Sandland-related pottery firms that worked in Hanley: "...a firm called Sandland & Colley Limited (Lichfield Pottery) manufactured pottery in Hanley from 1907 - 1910. More prolifically, and much more well known, is the Lancaster & Sandland of Dresden Works, Hanley who manufactured 'Sandland Ware' pottery from 1944 until the 1970s. " 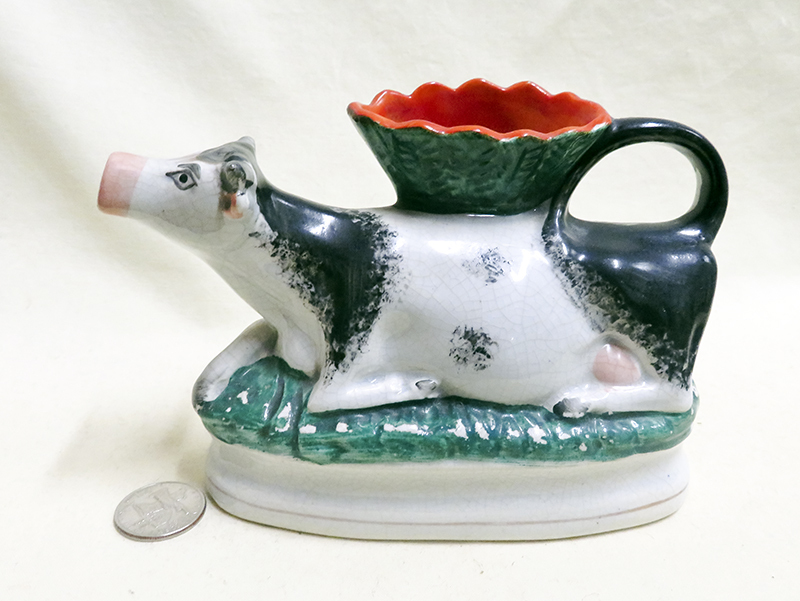 This cow is in very good condition, but could easily date from the early 20c; my guess would be that it's from the Sandland & Colley firm , since most of the "Sandland Ware" pieces I've seen on the web have a very different maker's mark. Perhaps a Sandland collector, or a member of the family, can help me here. Here are five examples of another popular shape, depicting a cow with a relatively long neck and conical head raised and mooing. The ones on the left in both pictures are said to date from 1890’s, and the two on the right are most likely from around the same period. 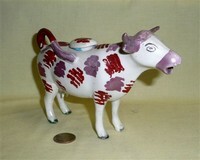 The one in the center with the mottled red markings on its side is a modern reproduction. Note that all of these seem to have gilded horns, and some sort of raised flower on the base. Here are two more variants of this form, both showing their late 19c age a bit, but with interesting coloring and decoration. 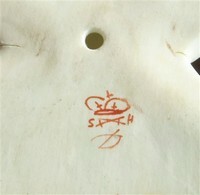 Another of the same shape, white with blue markings. What made this one of interest to me is that the base has been cracked, and is held together with staples. There is also a staple that’s visible in the picture just above the front left hoof. These were apparently an early form of repair before the advent of modern glues that work well on ceramics. Here are four examples of creamers with the popular ‘Blue Willow” pattern transfers. The potteries’ website notes that “The origins of multicoloured underglazed printed pottery go back to 1756 when John Sadler and Guy Green invented the process of transfer-printed decoration on pottery”, and that “Transfer printing is a process by which a pattern or design is etched onto a copper (or other metal) plate. The plate is then inked and the pattern is "transferred" to a special tissue. The inked tissue is then laid onto the already bisque fired ceramic item, glazed, and fired again. Initially patterns were transferred to the ceramic items after glazing, but the ink often wore off, thus "underprinting" was born. Transfer items have a crisp, almost decal look about them. If you look closely you can often see the place where the transfer design ends. Often these are the areas where the pattern doesn't quite match, like wallpaper.” Blue willow, indeed anything Chinese, was extremely popular since it was first imported in the mid-18c, albeit imports slowed down as British potters learned to copy the style. These examples are said the date from late 19c or early 20c. They are all from molds similar to creamers I’ve shown elsewhere – long-necked, ‘Kent-like’, or similar to the brownish one with the ‘Majolica’ glaze. 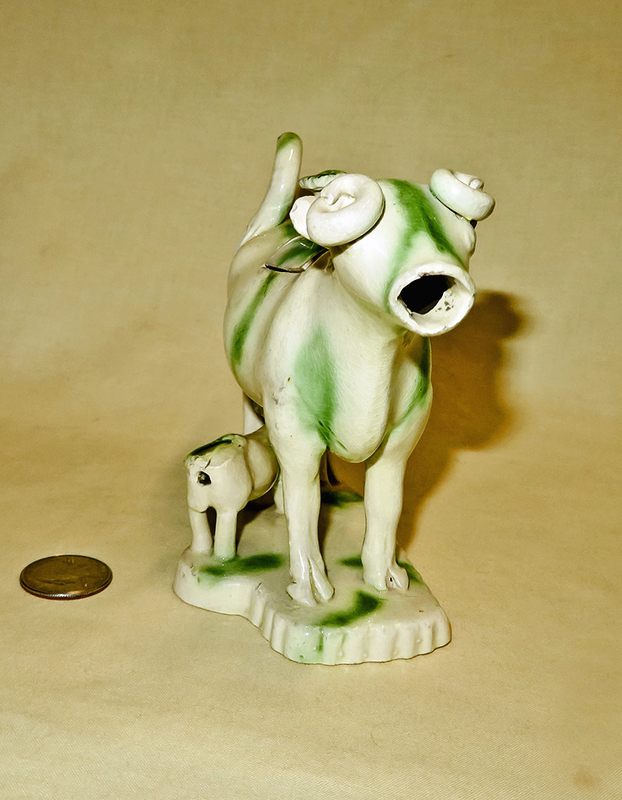 This lovely dark green glazed 19c creamer really has me puzzled. It bears a remarkable resemblance to some of the ones near the bottom of the Bennington page, but the coloration and glaze is unlike anything I’ve seen from early American pottery, and it bears the traditional fly, which is also very British. 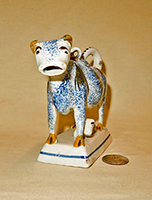 The Connecticut antique dealer who sold it on eBay sold it as “Whieldon, Staffordshire or Pratt circa 1820” and could provide no information beyond that it came from an estate of English ceramics from the 1700s and 1800s. Sure wish I knew more…it’s really lovely, and in superb condition. 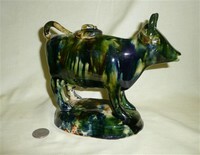 This Rockingham glaze cow is very similar to the green one above, except for the shape of the base. Given the similarity of features like the eyes, ears, side striations and fly on the lid, I’d imagine that they came from the same mold, albeit molds did move among makers. 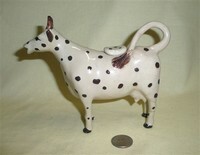 In contrast to the cow-and-person figurines which are typically made of heavy pottery, this is a porcelain creamer with the fill hole in the back of the cow. It’s very finely made and painted, but has no marks and I have no information about its age or maker. 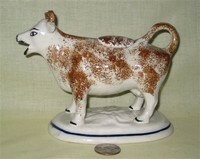 Some 20 years after acquiring the Stevenson and Hancock Derby porcelain cow shown above, this one became available on the UK ebay site. Thankfully the seller was willing, when asked, to ship to the US (for a price). It is from around the same 19c period but has obviously been decorated by a different painter, and the maker’s mark, here quite blurry, is in blue. Although not readily noticeable, this one is slightly larger than the one above, and is slightly slouched in the hindquarter. Also it retains its lid…and was less than a quarter of the cost of my first one - a sign of the change in the markets, the impact of eBay as opposed to antique fairs, and my considerably greater experience as a buyer! 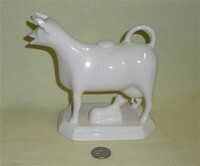 Here is a glazed white version of this same Stevenson & Hancock creamer, said by the English seller to be from the 1890s. Interestingly, it seems that S&H wasn’t the only firm to employ this or similar molds. C. Cooke of Staffordshire, so it legitimately fits here. I don't have a date for it, but for sure it's from pre-1995, since that's when MAJiLLY was purchased by Martha and Tony Emilio and moved to Pomfret Center, CT (see www.majilly.com). 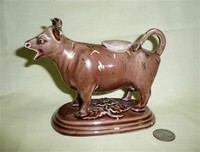 There is a picture of C.Cooke's mark on www.thepotteries.org, but no further info about this potter, and neither the seller nor the current MAJILLY folks could supply any further information. Help would be greatly appreciated. 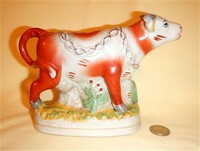 Here’s another creamer with calf from the same mold and bearing the C. Cooke, Staffordshire, England mark. 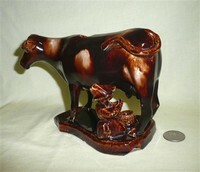 I believe this large one with a calf is also quite modern. 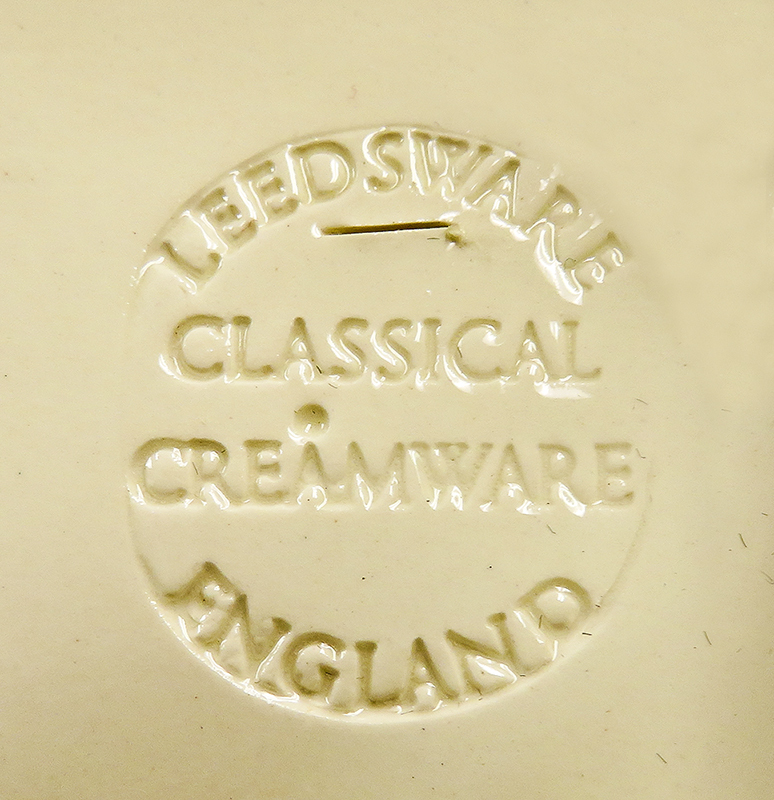 It is clearly impressed for “Leedsware Classical Creamware, England”, and there is an interesting story here. From www.worldwideshoppingmall.co.uk’s section on pottery we learn that “Brothers' John and Joshua Green in partnership founded LEEDS POTTERY in Leeds in 1770 with Richard Humble. Success soon came with the production of household goods in a variety of ceramic bodies, the most popular being CREAMWARE, a type of earthenware made by several companies from white Cornish Clay with a translucent glaze, producing the pale cream colour from which it took its name…By 1781 William Hartley had added his design and business expertise to the Green brothers' production skills and under the name Hartley Greens & Co the company flourished, expanding its trade across Europe and into Russia. 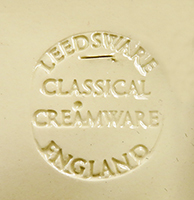 Such was its success that from then on Creamware would also be known as Leedsware. In the 19th century after the death of its founders the different tastes of the Victorian era brought a gradual decline in business, leading eventually to the Pottery's closure in 1878. 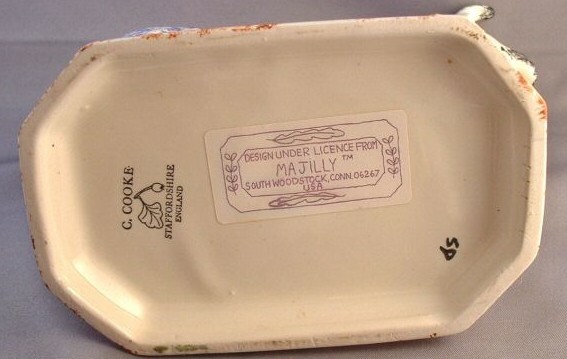 Despite the later demolition of the kilns and buildings, surviving moulds and clues from pattern books together with fine examples of Leeds pieces in local museums enabled production of Creamware to the original designs to continue to this day.” In trying to track down the manufacturer of my version I learned (from a kind person at Hartley Greens) that the old Leedsware molds were sold off by the Leeds City Council around 1988 in two lots. One lot was purchased by Hartley Greens (which has a nice history of Leeds Pottery on its web site), and the other by Classic Creamware, which in turn was bought out, although the company that bought them no longer makes creamware. So either my creamer is 18c, which I doubt, or it’s only a couple decades old and the mold for it is still around, somewhere. Help please, anyone?? 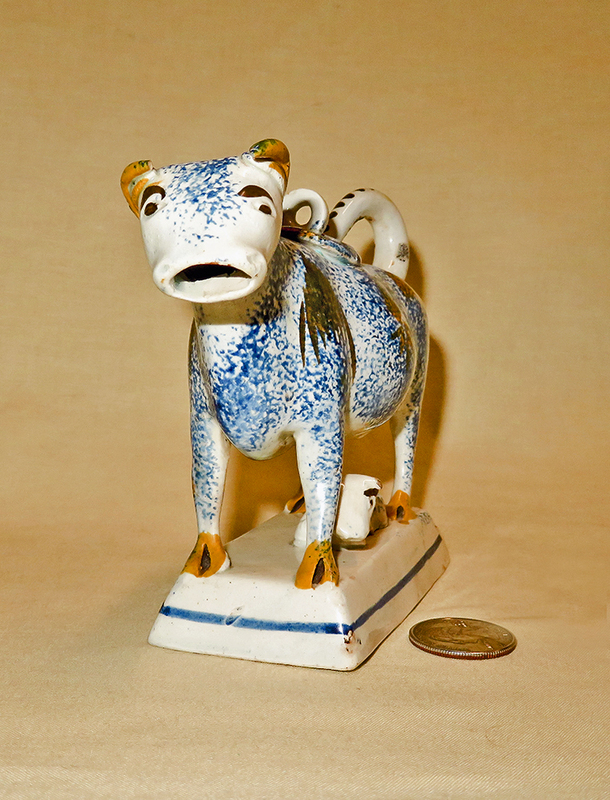 Here is a colored version of this same Leedsware Classic Creamware cow and calf. Yet another, which I acquired largely because of its peculiarities. First, the calf is facing in the opposite direction. Second, the top of the base has been painted green, over the glaze … and third (which I didn’t notice till it arrived), the “Leedsware” impression on the bottom of the base has been filled in and painted over. 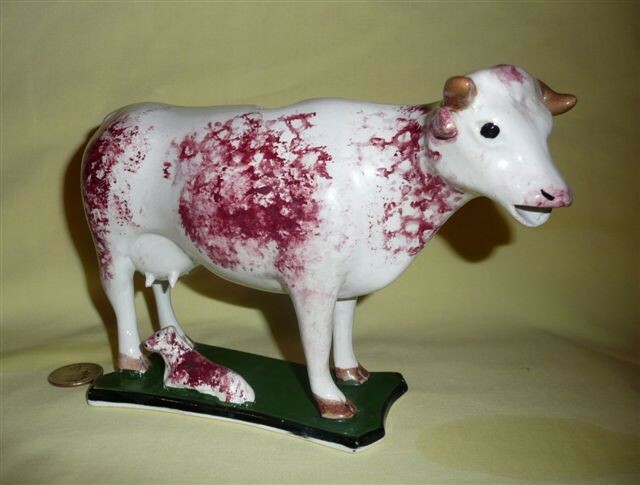 Hard to know why anyone would do this, but the seller who had acquired it in that condition didn’t try to mis-describe it, just said it was ‘vintage Staffordshire’ and offered it at a very low price. milk pail. Must have been a very frisky cow. 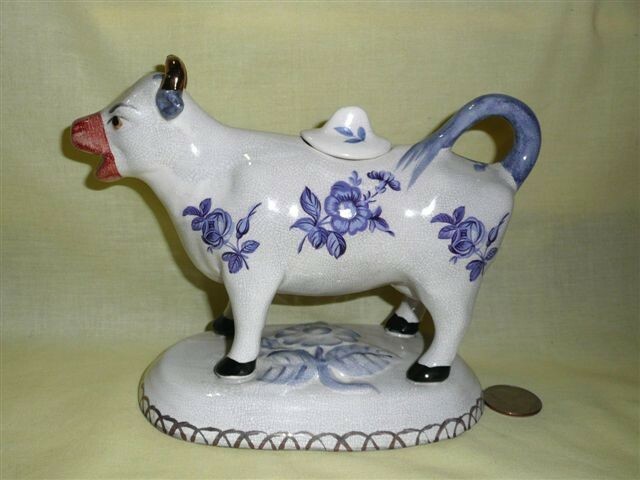 I have never seen this on an original old English cow creamer, and am thus wondering if the model had this feature or if it was added by the imagination of the potter. 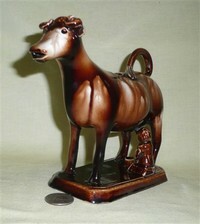 There was a horse figurine by the same potter for sale at the same time, which I didn't purchase. Finally, here are a couple ‘sports’, about which again I have little to no information. The one on the left would appear to be modern (and bore a very modest price tag). 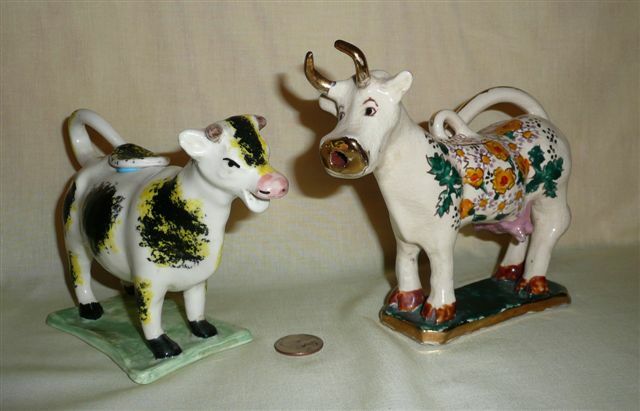 The wacky cow on the right, which came from the UK via eBay, was called ‘Faience’ by the seller. The flowers and leaves on its sides are raised, the lid is cut into the back (like my very early Whieldons), and the base bears a hand-done monogram of an overlapping T and R. It is certainly very different from any of the others. This brief description is derived principally from “Welsh Ceramics in Context, Part 1”, edited by Jonathan Gray and published by the Royal Institute of South Wales with support from the City and County of Swansea in 2003, supplemented by several articles from the web. Swansea is located on the southwest coast of Wales, in what was then the county of Glamorgan (Glamorgan has been significantly reorganized several times – the potteries discussed here were in what is now the City and County of Swansea*) at the sheltered mouth of the river Tawe. Given its navigable river, decent harbor, access to local and overseas markets and abundant local coal, it has been a center of trade since Viking times. With the coming of the industrial revolution it was a logical center for the development of copper smelting, and this began in the Tawe valley near Swansea in 1717. By the end of the 18c eight smelters had been founded within three miles of the town (making a mess downwind), and given the advantages of cheap coal and easy transport by sea, many other industries followed. One copper smelter near the town was established by James Griffith in 1720. When the lease on the ground of this older copper works was surrendered in 1764, it was taken up by William Coles and his partners, to establish a pottery. There had traditionally been a simple earthenware pottery tradition in the area, but this was the first attempt to establish a larger and more ‘modern’ manufactory. Industrialization had created a demand by the more wealthy segments of society for fashionable wares and for finer ceramics such as were being imported from China and the continent. Developments in Staffordshire, particularly those by Josiah Wedgewood - both by emulation of technique and by the availability of skilled specialist workers - formed the basis for this Welsh expansion that was designed initially to meet the needs of the local market. It took several years to demolish the old copper works, hire the needed experts, and erect the kilns and other facilities for the new trade, but production began in 1767. By 1771 this pottery had hired a master potter from Staffordshire and was producing both saltglaze and creamware bodies. William Coles died in 1778, and the pottery struggled (as did many such industries in that era) until Coles’ son was joined by George Haynes, who had lived for several years in Philadelphia. In 1790 a fresh lease was taken for them in partnership. Haynes, who had initially come back to England thinking of retirement and likely remunerative investments, soon was deeply involved in what was soon named the Cambrian Pottery, and became its manager. Haynes is credited with considerable upgrading and expansion of the works, as well as attracting a talented engraver, Thomas Rothwell, to produce transfer printed as well as enameled wares. The pottery benefitted from the reopening of trade with America coupled with Haynes’s Philadelphia contacts, and it thrived in the 1790s. 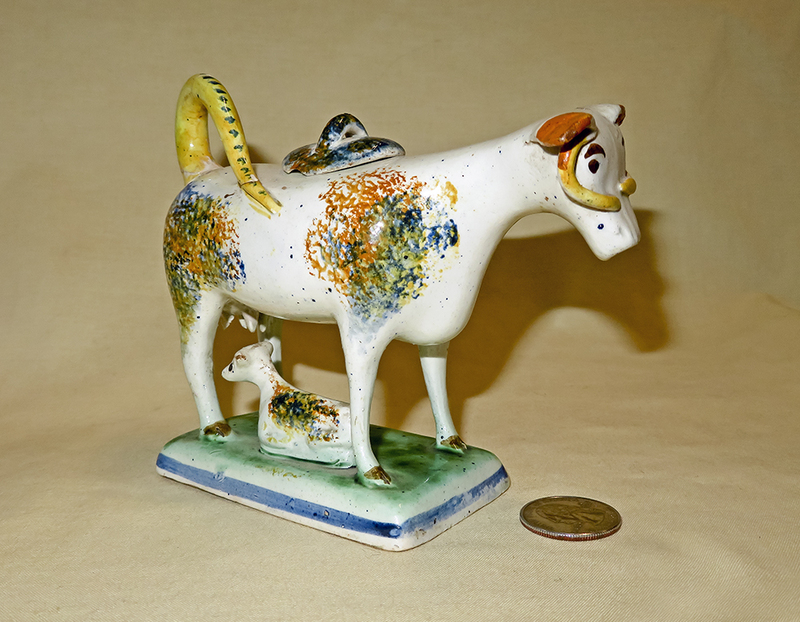 Swansea continued to profit from developments in Staffordshire, particularly those by Wedgewood; and it is not unlikely that cow creamers, as well as other tea and dinner service items and a widening range of wares, were produced there during this period. In 1799 Edward Coles died and the Coles’ assets were assigned to Haynes. In 1801 the American Quaker and merchant William Dillwyn visited Swansea, then returned in June 1802 to make an arrangement to buy part of Haynes’s interest in the pottery on behalf of his son, Lewis Weston Dillwyn. Haynes initially remained as manager, with day to day supervision of the works by Edward Green and the firm’s agent Thomas Belington (who became a partner in 1811). Lewis Weston Dillwyn was primarily a naturalist and spent most of his time in London, thus being a largely absentee proprietor. This worked well until 1809 at which time relationships between Dillwyn and Haynes deteriorated badly and Haynes departed in 1810. Haynes had surreptitiously acquired a lease of foundry buildings adjoining the pottery, and established a soap works there. This was an extremely smelly business and had a very adverse impact on Cambrian’s workers and customers; Dillwyn was convinced this was malicious, took legal action and won the case. Haynes then established a rival pottery, the Glamorgan, adjacent to the Cambrian. Haynes initially financed as well as managed the new business, then brought in his son in law William Baker, and as well as two other financial partners, Bevans and Irwin. This accounts for the “BB&I” mark which was used on their wares, which were made largely for domestic use. 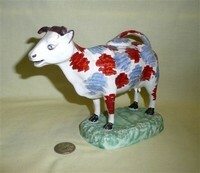 There were no effective patent or copy write laws in those days and many of Haynes’s workers followed him, so the new firm produced lines of transfer printed and enameled creamware and pearlware that were very similar to those of the Cambrian, albeit with some differences in molds and technique. Haynes died in 1830 and the Glamorgan languished through the lack of his experience, finally being sold in 1837 following the loss of Baker and the bankruptcy of Bevan’s Iron Works. It was purchased by Lewis Llewellen Dillwyn, Lewis Weston’s son, who had run the Cambrian since 1836. He then sold most of its assets to the man who used them to help establish the ‘South Wales Pottery’ in Llanelly. Competition from this new venture helped lead to the ultimate demise of the Swansea pottery in 1870. 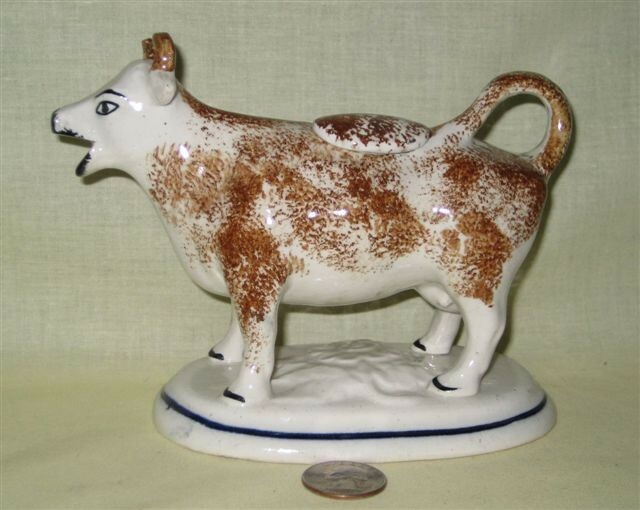 The Swansea cow creamers – a very minor part of the business just as in Staffordshire – were all creamware or pearlware, as far as I know. However there were many attempts in Wales to produce competitive, high quality porcelain – both at the Cambrian under Lewis Weston Dillwyn from 1814-1817, and by the celebrated china painter William Billingsly who had spent many years at the porcelain works in Derby, at Nantgarw as well as with Dillwyn in Swansea. 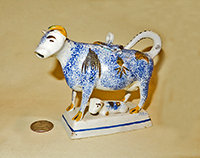 Although the basic ‘recipe’ for this prized ceramic had been available in England since around 1765, it was exceedingly challenging to produce regularly and at reasonable cost due to kiln losses, and this industry never fully succeeded in Wales albeit the pieces that were produced were of very high quality. * From Wikipedia we learn (more than you likely want to know) that “Glamorgan or sometimes Glamorganshire, (Welsh: Morgannwg or Sir Forgannwg) is one of the thirteen historic counties of Wales and a former administrative county of Wales…Glamorgan's terrain has been inhabited by humankind for over 200,000 years…The region originated as an independent petty kingdom named Glywysing, believed to be named after a 5th-century Welsh king called Glywys, who is said to have been descended from a Roman Governor in the region. … The name Morgannwg or Glamorgan ('territory of Morgan') reputedly derives from the 8th-century king Morgan ab Athrwys, otherwise known as "Morgan Mwynfawr" ('great in riches') who united Glywysing with the neighboring kingdoms of Gwent and Ergyng, although some have argued for the similar 10th-century ruler Morgan Hen… By virtue of its location and geography, Morgannwg or Glywysing was the second part of Wales, after Gwent, to fall under the control of the Normans and was frequently the scene of fighting between the Marcher Lords and Welsh princes…The Lordship of Glamorgan was established by Robert Fitzhamon following the defeat of Iestyn ap Gwrgant in the 1080s. The Lordship of Morgannwg was split after it was conquered; the kingdom of Glamorgan had as its caput the town of Cardiff and took in the lands from the River Tawe to the River Rhymney. The Lordship took in four of the Welsh cantrefi, Gorfynydd, Penychen, Senghenydd and Gwynllwg. 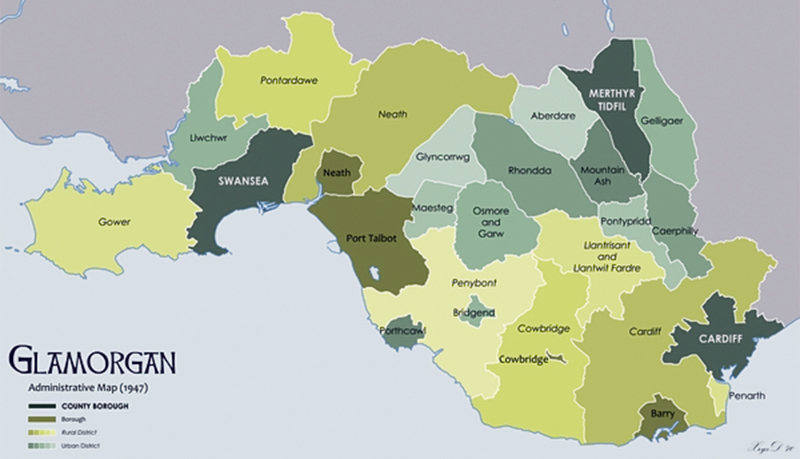 … The Laws in Wales Acts of 1535 established the County of Glamorgan through the amalgamation of the Lordship of Glamorgan with the lordships of Gower and Kilvey; the area that had previously been the cantref of Gwynllwg was lost to Monmouthshire. With Wales finally incorporated with the English dominions, the administration of justice passed into the hands of the crown. The Lordship became a shire and was awarded its first Parliamentary representative with the creation of the Glamorganshire constituency in 1536… From the mid-18th century onwards, Glamorgan's uplands underwent large-scale industrialization and several coastal towns, in particular Swansea and later Cardiff, became significant ports… Under the Local Government Act 1972, the county boroughs and administrative county of Glamorgan were abolished on 1 April 1974, with three new counties being established, each containing a former county borough – West Glamorgan, Mid Glamorgan, and South Glamorgan. It 1996 these areas were reorganized into several unitary authorities by the Local Government Act of 1994 (an Act of the Parliament of the United Kingdom which amended the Local Government Act 1972 to create the current local government structure in Wales of 22 unitary authority areas, referred to as principal areas in the Act, and abolished the previous two-tier structure of counties and districts.) It came into effect on 1 April 1996… Since 2013, Glamorgan has had its own official flag, red with three white chevrons.” Glamorgan is now referred to as a historical county, and West, Mid and South Glamorgan are preserved counties “for the limited functions of Lieutenancy and High Shrievalty”. "Administrative map of the County of Glamorgan in 1947"
This is a modern (but made with traditional hand-crafted techniques) reproduction of a Swansea, Cambrian cow creamer from the early 19c. 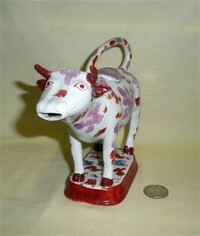 It serves here as a good example of this factory’s cow creamer molds, as well as their typical red and blue enamel coloration. 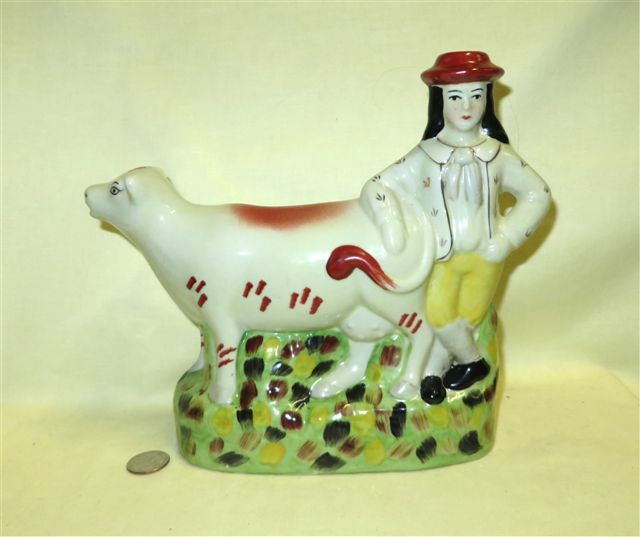 I have learned quite a bit about this handsome reproduction creamer from a very kind collector who inherited one from her mother (who in turn received it from the managing Director of Beefeater UK Ltd who obtained it as a gift in 1988). Mine is #106 of the 200 produced by the Gladstone Pottery Museum, which is located in Longton, Staffordshire and has a broad ranging collection of UK ceramics. These limited edition creamers were commissioned in 1987 by Express Foods Group, Ltd to commemorate the opening of a new ultra modern cheese packing factory in Oswestry which was opened by HRH the Duchess of Kent. My cow-respondent noted that Empress Foods “appear to have been acquired by Diageo CL3 Ltd in January 2011 who then changed their name to Diageo CV Ltd and are now based in Park Royal, Greater London. It isn't clear whether they still manufacturer food based products.” A web search turned up the information that “Diageo is a global leader in beverage alcohol with an outstanding collection of brands across spirits, beer and wine categories. These brands include Johnnie Walker, Crown Royal, JεB, Buchanan’s and Windsor whiskies, Smirnoff, Cîroc and Ketel One vodkas, Captain Morgan, Baileys, Don Julio, Tanqueray and Guinness.” I will admit to having sampled a number or their products…but I wonder what they did with the cheese factory. 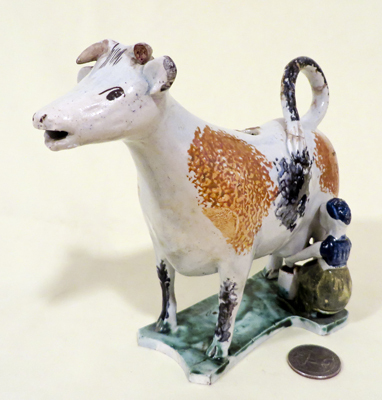 This closely matched pair of Cambrian cow creamers dates from ~1820 according to the seller, a London dealer in early ceramics. They do indeed 1ook a lot like the ‘prototype’. I believe they might actually date from somewhere in the 1810’s. Here is another example of the typical Cambrian cow creamer, this time with brown horns. 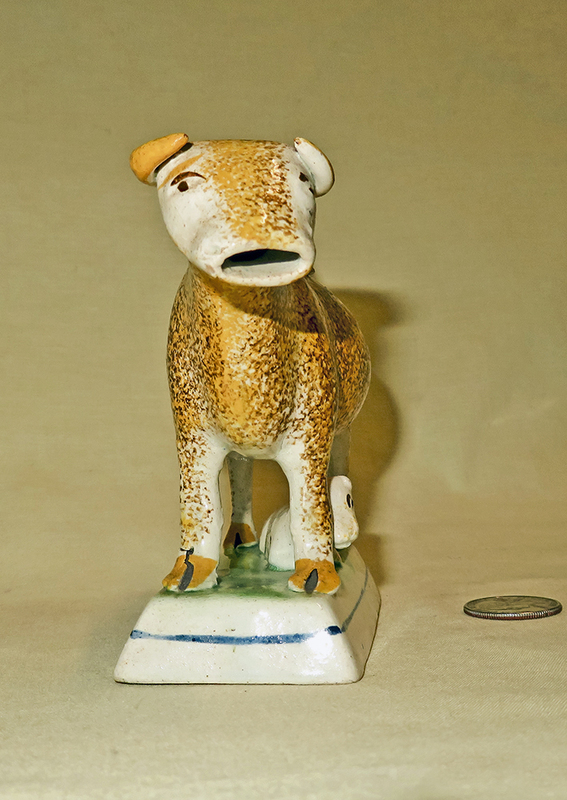 Both Glamorgan and Cambrian potteries produced cow creamers, and given the connection between the two via George Haynes it’s not surprising that they were quite similar. 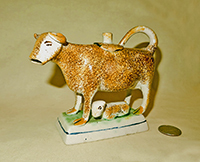 Here is a good example with which to compare of the differences, as described in the “Welsh Ceramics in Context” book and (although I can’t find the reference recently) the web site of the Swansea museum: The key feature is the brisket or breastbone, which is pronounced and protrudes downward on the Cambrian cows - here the one to the right – and is more slender on Glamorgan cows. The Glamorgan ones also had a squarer head. 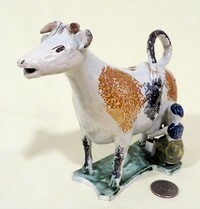 Another difference is shown here – the Glamorgan cows were commonly transfer printed with a rural fishing scene, and were marked “Opaque China over “BB&I”. The term, “opaque china” is attributed to Haynes, who coined it for the fine white earthernware from the Swansea potteries. Apparently most of the Cambrian cows had the red and blue enamel like shown above (more examples follow), or patches of pink luster. Examples of both of these creamers are shown on p.112 of the cited reference, and it notes that the few Cambrian ones that were transfer printed had this design of shells and flowers. I would imagine that at least the fishing scene, and perhaps the flowery one, were from engravings by Thomas Rothwell. They are nicely applied on both of these cows., and I’m delighted to have these examples in my collection. From the coloration, shape of the breastbone, and shape of the base, I’m almost positive this cow came from the Cambrian factory. The dealer from whom I bought it in Stow-on-Wold in 1997 only said that it was early 19c. In general, I’m finding that most of the dealers have at least as hard a time as I do, pinning these things down. 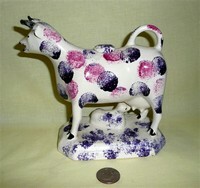 There’s bit of a different approach to the coloration here, and slender breastbones…as well as what would appear to me to be the decorator’s mark as well as a small impressed “10” on the base of the cow to the right…I’m guessing This one is Glamorgan, probably a less expensive versions than the transfer printed ones which may account for the lack of a “BB&I”. I bought it from a dealer in Cheltenham, who dated it to early 19c but had no knowledge of its provenance. The one on the left is a bit more problematic – red and blue enamel, a fairly heavy chest, and a base similar to those from Cambrian. The antique dealer for this one was Jacqueline OOsthuizen of London – supposedly knowledgeable – and they dated it to ~1840. This one is very different than the others, but I’m pretty sure it’s also Swansea. I got it in Cheltenham where it was dated to ~1800 - 1810…but the rounded chest and flat wide head would suggest Glamorgan according to the guidance I can find in the sources. Like most of the others it’s had some restoration – horn tips and tail. Here is a close mate that bears typical Swansea coloring – pretty badly beat up with lots of restorations, but acquired at what – for these early creamers these days (2014) – was a quite reasonable price, under $100. And of course one never really knows what shape they’re in until they arrive. This one also came from Jacqueline OOsthuizen’s London shop in 1997 – They said Swansea ~1850, which would put it for sure from Cambrian, after the closure of Glamorgan. It and the ones that follow below are very different than the earlier molds – not surprising that tastes would have changed over 30-40 years. It is missing its base – although it has touches of green on some of the hooves, to me a clear indication that it once had one. I was fairly early in my collecting in those days, however, and didn’t notice that till much later. 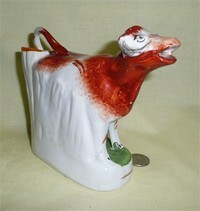 I probably still would have bought it as a nice example of a somewhat later Swansea cow. 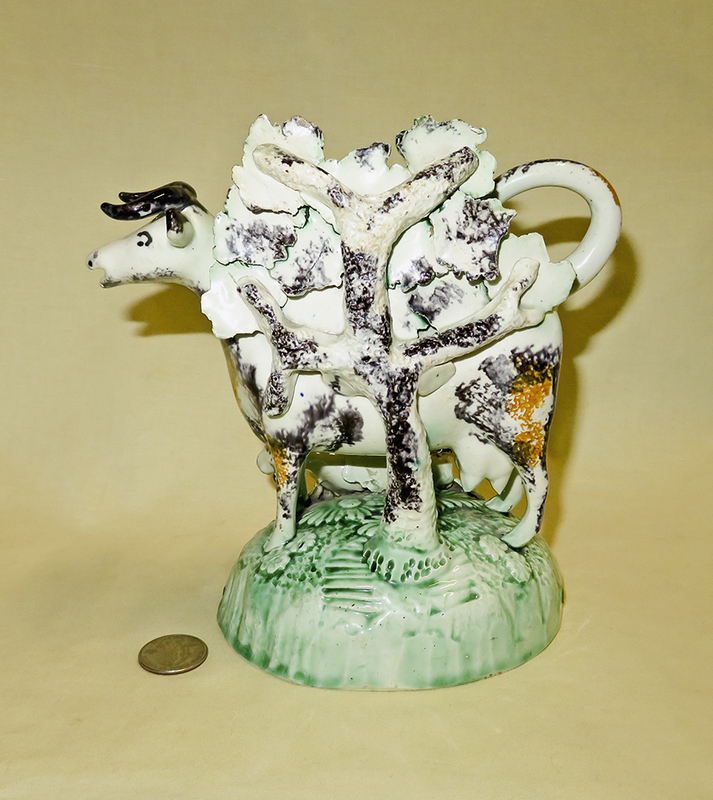 Here is a modern Welsh cow creamer (as is quite apparent from its large sticker), that I believe fits better here than in the ‘modern Variations pages. Although quite young it’s a bit battered with a re-glued right real leg and left ear and missing horn tips. The seller suggested a maker but when I contacted him he denied responsibility, and the Mid-Wales Development folks (who have changed since ’84) were unable to offer any assistance - but there are indeed a number of potters in the area and maybe one of them will see this and claim ownership. It’s really quite a lovely piece despite its hard life. Friction matches like we’re used to today weren’t manufactured – if that’s the right term – until around the 1820s in England. Even then, for decades they were much too expensive and rare for routine use, so people used or slivers of wood – sometimes specially shaved for the purpose – or more dangerous paper tapers to transfer fire and light lanterns and cigars or pipes. These fire-starters are called ‘spills’, and because they were needed frequently, folks would keep a bunch of them in a vase that usually sat on the mantle. In the grand British tradition, utilitarian items like spill vases morphed into fancier wares that were also decorative, especially during the Victorian era, providing yet another market for the inventive Staffordshire (and other) potteries. 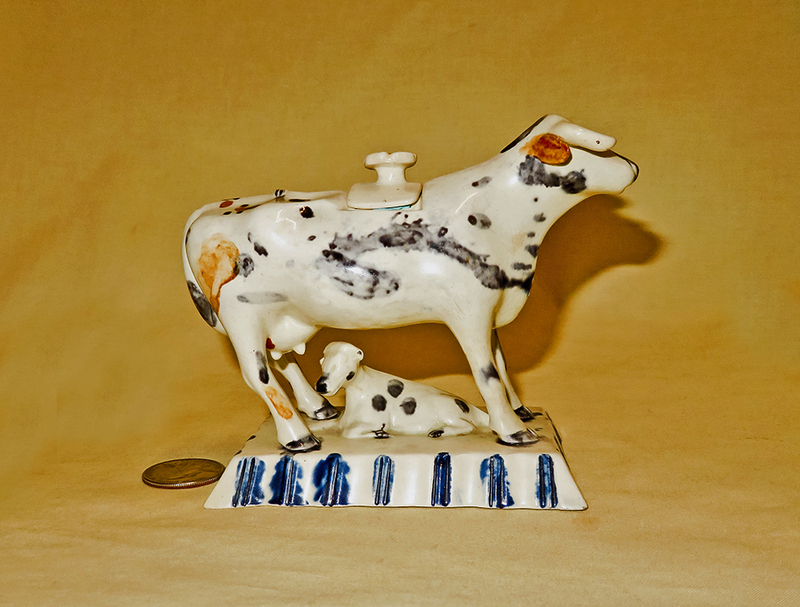 Naturally enough, topics that were already popular as Staffordshire figurines – including cows, milkmaids, dogs, horses, etc – became decorations for spill vases. The pair shown here – small decorative porcelain bisque versions dating from around the 1870s – are not atypical. While these two which I’m using to introduce this sub-theme do have cows, the cows are solid. 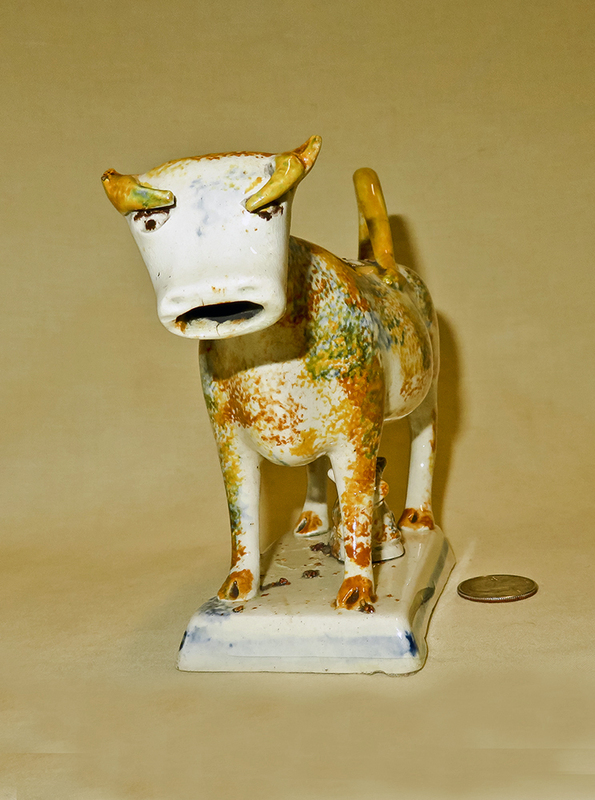 In many cases however, cow creamer molds were modified and pressed into service as the decorations for the spill vases…and indeed, I’d guess that if you weren’t fussy you could use them for either purpose. Here are three typical cow-creamer spill vases, dating from the mid to late 19c; the hole for the spills is in the top of the head of the two milkmaids, while the boy is accompanied by the rather typical ‘tree trunk’ that serves as the spill holder. Since these vases were made to sit on mantles, their backs are almost invariably flat and undecorated. This one is a bit unusual in that the boy is sitting on some sort of bench or stone next to the tree, rather than standing next to his cow. 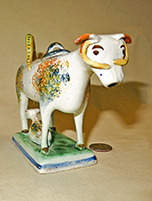 The cow has lost a bit of its paint and has an old chip inside its upper lip, but it’s otherwise in fine shape and was reasonably priced. These two – which I bought on-line at an auction – are flat-backed and have the tree trunk shaped spill holder which is typical of early to mid 19c spill vases. But… the cows have open mouths – they do pour - and they were sold as creamers. It may well be that they could be used for either purpose. Spill vases were usually kept on the mantle above the fireplace, filled with rolled paper or thin wooden sticks – ‘spills’ – that were used to transfer fire from the fireplace to candles or lamps, or to light cigars. Creamers of course would more likely be found on the kitchen counter or table. Perhaps some enterprising potter figured he could satisfy a wider market with dual-use items like this, or – more likely - simply used a creamer mold to fashion an item that could be readily attached to a separate slip of a tree and base. Some of the spill holders are sufficiently complicated that they almost had to be made from a combination of items cast separately and they connected before firing. Two more - identical in style but of slightly different sizes - with flat backs and a hole in the top of the milkmaid’s hat. Here’s another late 19c variant – again flat backed, but with a much shorter tree trunk, and thus – I’d guess – more likely to find use as a creamer than as a spill holder. 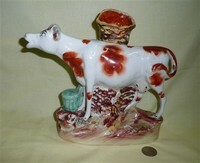 This is the only spill vase I’ve seen featuring a cow that is lying down. That gives it the practical advantage of being very stable. It has the typical flat back as well as a wide mouthed spill holder, and is designed to also serve as a creamer. 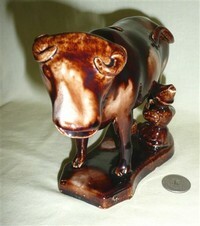 It is very nicely crafted and painted, and appears to have crackling under the glaze. 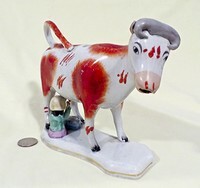 It came to me from Swansea in Wales, although I don’t know if the cow was actually made in that area – the seller, with whom I exchanged some pleasant notes that ultimately led to my longish discussion of the changes to Glamorgan County in the footnote to the introduction to Welsh Ceramics, simply said it came from the estate of a well known local collector. There is a spot on the base that looks like it might have been a mark of some sort, but it’s completely illegible. 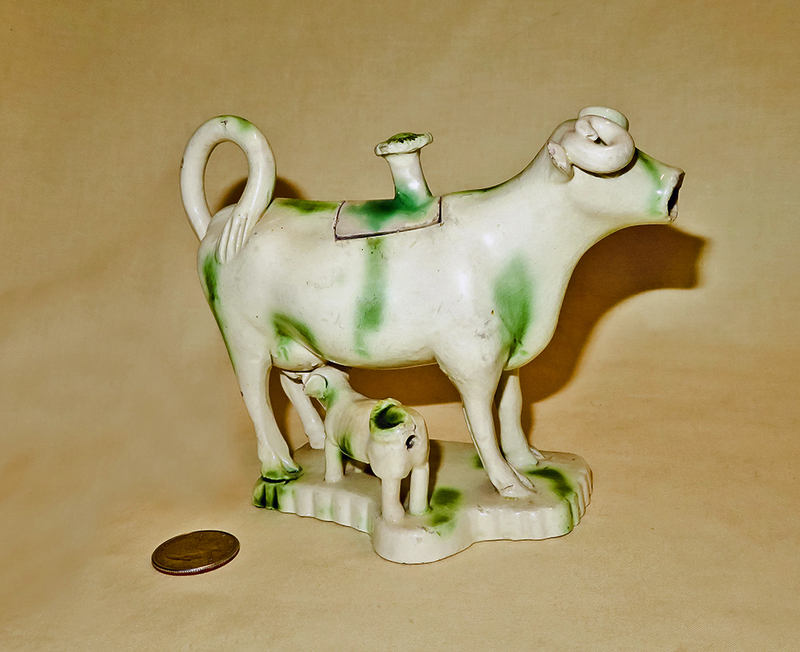 This is a quite large 19c example of a spill holder-creamer, with a very fine cow and a green bucket to accompany it. The whole top of the spill has been restored- makes me wonder how that could have broken off without damaging the cow in some major way. This large spill, in fine condition, appears to be from the same or a very similar mold, with a milkmaid added. 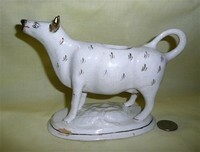 It was acquired from A & N Harding Victorian Staffordshire, based in Dover, England (albeit it was mailed from Jersey). 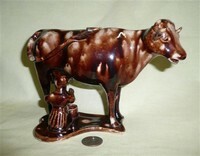 For those interested in fine Staffordshire Figures, as well as informative books about them, try www.staffordshirefigures.com. 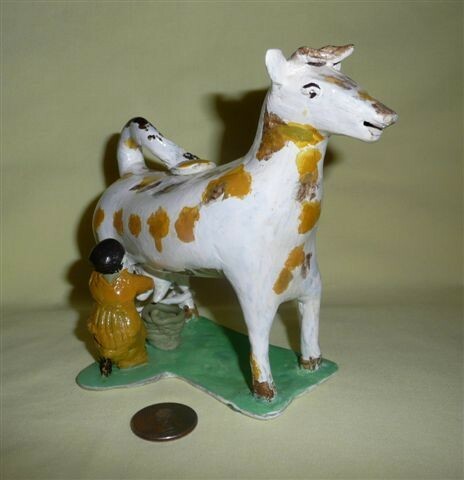 Here are two more examples featuring the same cow, with a slightly different milkmaid from the one above – but identical on these two except for her location. This is a very good example of how the potteries maximized the use of their molds to produce a number of variations using identical basic parts. 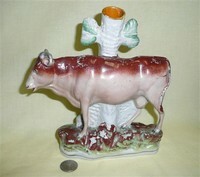 Another fine, traditional spill vase with cow and milkmaid. Apparently spill vases are still sufficiently popular as ‘collectibles’ that folks have decided to make reproductions. 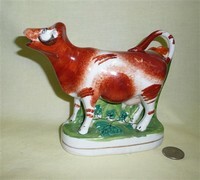 The orange and white one bears a small ‘Made in China’ sticker, and the one with the boy at the aft end of his cow, while not marked, is clearly very modern. So, per usual, buyer beware…especially on eBay where sellers often don’t know what they have.